Lock in a great price for Angelica Traditional Boutique Hotel – rated 8.8 by recent guests! The owners are nice people ^_^. The rooms were cute and comfy and clean. Well equiped with almost all you need. Incredibly friendly owners/staff who not only welcomed us, but solved a ferry ticketing problem that almost cancelled the visit to beautiful Hydra. Great location a short walk up from the harbor: quiet but still central. Charming property. Big beautiful room and amazing breakfast! The stuff were very helpful. The location met our needs and was reasonably convenient to the port area. We loved Hydra. The location of the hotel in Hydrra is ideal. Owners and staff were wonderful. The room was beautiful. The sWe would love to come back some day. I liked being a bit up the hill, but it's not for anyone with mobility issues or who wants to be directly on the water. Breakfast is lovely if you stick with the yogurt & honey & hard boiled (very) eggs with some Greek salad mix & breadsticks. Get your coffee fix down by the water. The staff was lovely, the breakfast was bountiful and good, the room had a nice shower. Loved the little touches, i.e.they put a big bottle of water in the refrigerator daily, the shower products were top notch. Also enjoyed the veranda with tables and big umbrellas. Great atmosphere! It is one of the best properties I've ever stayed at. Everything was just perfect. Great location on beautiful Hydra. Architecturally beautiful and nicely designed room Great breakfast. Wonderful and helpful staff. Fastest check in I have ever had - property owner was a pleasure. 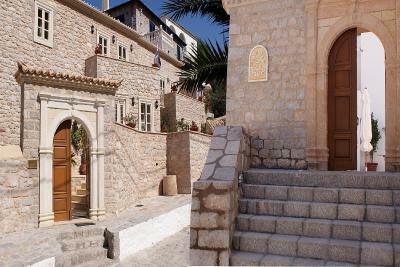 The property has tons of personality and was the perfect pick for our stay in Hydra. Angelica Traditional Boutique Hotel This rating is a reflection of how the property compares to the industry standard when it comes to price, facilities and services available. It's based on a self-evaluation by the property. Use this rating to help choose your stay! 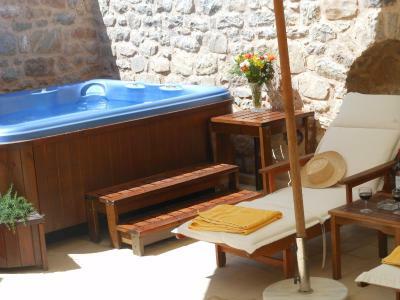 One of our top picks in Hydra.Set in a historic building in the heart of Hydra, Angelica Traditional Boutique Hotel features charming accommodations with spa baths or jet showers, and offers a courtyard with a mini pool, hot tub and sauna. Angelica’s romantic rooms retain a delightful note of old-fashioned charm and luxury. They are all air conditioned, and include satellite TV, safe and marbled bathroom with a complete set of Korres cosmetics. Guests can start their day with a Greek Breakfast served buffet-style, including fruit pies, local pastries and fresh eggs. The garden, offering a seating area with deck chairs and comfortable sun beds, is the ideal place for enjoying the breakfast or just relaxing. Angelica Traditional Boutique Hotel is located on the central road of the island, about 3 minutes on foot from the port. A variety of water sports are available at the beach, 800 feet from the hotel. The property can arrange transfer from Athens upon extra charge. Metochi Port, from where sea taxis to Hydra Island depart daily, is 3.4 mi away. 뀐 Located in the top-rated area in Hydra, this property has an excellent location score of 8.8! When would you like to stay at Angelica Traditional Boutique Hotel? Superior rooms feature a private furnished balcony or a spa bathtub. Features romantic-style decor with marble bathroom with shower and it is on the ground floor. Superior rooms feature a private furnished balcony. Located on the ground floor, this romantically decorated suite has a window and marble bathroom with shower. This classically decorated suite features a window or a large balcony. Some rooms have a spa bath. Features romantic-style decor with marble bathroom with shower and it is located on the first and second floor. House Rules Angelica Traditional Boutique Hotel takes special requests – add in the next step! Angelica Traditional Boutique Hotel accepts these cards and reserves the right to temporarily hold an amount prior to arrival. Guests should kindly note that vehicles are not allowed on the island of Hydra, with the sole exception of 3 trucks that belong to the municipality and are used for garbage collection. Any other vehicles are strictly forbidden, including the use of bicycles and scooters. Guests can reach Hydra Island either through Piraeus Port via ferry or through Metochi Port of Argolida (located 112 mi from Athens) via sea taxi. Please note that all standard rooms are located on the ground floor. The main reason I booked there was for the hot tub.... and when I got there is was in the other building and I was informed that the jacuzzi is never heated. Beautiful terrace, clean rooms, and friendly staff. Very nice location too. Very good location not too far from the harbour. A beautiful stone building with very attractive décor and a homely feel. Finding staff took a while, when checking in and out. It wasn't clear if breakfast was included or not. Quite expensive for what it is. Room was very plush compared to others, and courtyard area was good. Average walk to the harbour, but does mean it is quieter at night, being away from the bars. One of the best places to stay in Hydra! Lovely room! Very quiet location. Beds, beds, beds. Very uncomfortable. Also no proper hairdryer available. Only one in bathroom which we found very poor quality. And no team/coffee facilities in room. Great location, beautiful bedroom, lovely terrace area for breakfast, lovely welcome. Very well located and a traditional style hotel. Our experience at this place was horrible due to poor customer service from the owner side. The night we got to Hydra, the island lost electricity. We had no shower, no flashing toilet, no lights or AC for second day in the row. There was nothing to eat as all tavernas closed due to no power and had to buy food at supermarket. As solution was nowhere near and nobody could tell us what will happen, and also due to my skin condition, we decided to leave the island as we had 5 more nights ahead of us. In the village, all tourists told us that hotel owners are giving guests their money back. So we told the owner of our hotel the obvious reasons why we were leaving and we were willing to pay full price for the 2 nights we stayed. Although our conditions were terrible and we should have been given a discount. He insisted that we pay 3 nights, although we only stayed two. He was blaming it all on booking.com, saying he has to pay THEM our ENTIRE stay of 6 nights, which I knew was a lie. He told me that water is running in my room, which it was not (entire island was without) so again a lie. He had a generator but used it only in the other part of the hotel, not our side. When we told him we disagree to pay third night, but he didn't care and kept saying he has to pay booking.com entire amount and he basically doing us a favor. . I would have called booking .com at that time but unfortunately I only had 5 percent of my phone battery and journey to a diffrent island ahead. I called booking com upon my arrival there and they talked to him. He again lied to them and said we left in spite of the fact that we had water and electricity. Again, a lie. It is ridiculous that they don't have their backend in order and then try to stiff the tourists that are looking forward to their time of entire year. I would not recommend anyone staying here, because if there is a problem, he will not solve it for you and will try to stiff you. Hospitality +++ We arrived totally exhausted after an all night ferry trip and our host was so kind to let us into our room much earlier than normal. The room had everything you needed, plus great air con for the 30++ temps. Very spacious. Highly recommend. The decor & the quiet.